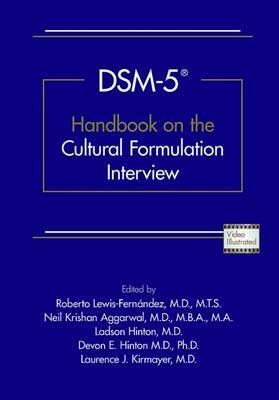 DSM-5 ® Handbook of the Cultural Formulation Interview provides the background, context, and detailed guidance necessary to train clinicians in the use of the Cultural Formulation Interview (CFI), which was created as part of the 2007-2013 DSM revision process. The purpose of the CFI -- and this unique handbook -- is to make it easier for providers to account for the influence of culture in their clinical work to enhance patient-clinician communication and improve outcomes. Cultural psychiatry as a field has evolved enormously from the days when it was principally concerned with epidemiological and clinical studies of disease prevalence; it now examines a multitude of issues, primary among them the differing patient, family, and practitioner models of illness and treatment experiences within and across cultures. The editors, all of whom have been intimately involved in the evolution of the field, have designed the book and accompanying videos for maximum instructional and clinical utility. The Handbook boasts many strengths and useful features, including: A detailed description of each of the three CFI components: a core 16-item questionnaire, which can be applied in any clinical setting with any patient by any mental health clinician; an informant version of the core CFI used to obtain information from caregivers; and 12 supplementary modules that expand on these basic assessments. This material facilitates implementation of the CFI by clinicians. Over a dozen clinical vignettes are included to illustrate use of the three components, and the Handbook also includes multiple videos that demonstrate the application of portions of the core CFI, and several supplementary modules. Strategies for incorporating the CFI into clinical training are identified and discussed, furthering the objective of developing culturally-sensitive and astute practitioners. The theoretical bases of the CFI are explored, raising questions for discussion and identifying areas for further research. The CFI is a valuable tool for all patients, not just those judged to be culturally different. The CFI has been called the single most practically useful contribution of cultural psychiatry and medical anthropology to clinical psychiatry, primary care, and medicine in general. DSM-5 ® Handbook on the Cultural Formulation Interview is the only book on the market that equips readers with the skills and insight to incorporate the CFI into practice, making it a critically important addition to the clinical literature.